Novell is recruiting and appointing Microsoft employees or Microsoft-sympathetic figures to occupy top positions. At the same time, it viciously fights Microsoft rivals like Sun and Red Hat whilst veteran Novell engineer, Greg K-H, chooses to throw mud at Ubuntu/Canonical. It’s not exactly shocking that, based on this new survey, Novell may not survive for more than 12 months. It still operates at a loss. #1 among technology companies… as one which is likely not to survive this year. Can Novell Survive 2010 Without Being Acquired/Merged? I would have said SCO myself, but considering how they keep managing to find money under rocks, and that they have nothing which would make them worth purchasing, I guess that they might make it into 2010. I have a good update about SCO coming, but I’ll do it tomorrow because the server is on its knees (Slashdot effect) and I can hardly get pages to load up. SCO filled bankruptcy last year so they wouldn’t really make good article material. I’d like to at least keep track of their mischiefs. Groklaw will possibly resume and without Groklaw it’s hard to tell what’s going on because it’s a low-profile case. The site will hopefully be responsive again some time later tonight. I used Coral to lower the load right from the start, but it wasn’t enough to endure the rush. Yes, the server does seem to be overloaded. I’ve had problems reading articles here today, even during working hours (I was off work today). I put it on Coral, but it was too much. I did the best I could though, so no regrets are necessary. Maybe we just need to move to a stronger server. I think that on the busiest day we clocked almost 20GB in one day (last year), excluding traffic on the mirrors. Since then, Novell has readjusted its roadmap so as to focus more on Microsoft technologies, i.e. technical alignment. Aside from Mono, which is a minuscule if not none existent part of Novell’s money making product lines, what have they exactly lined up? 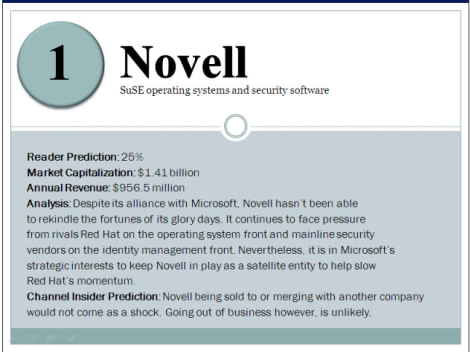 If you’re talking about strategic alignment, just keep something in mind, most of what Novell makes money from is in direct competition with Microsoft offerings. It has a decreasing impact though. For Microsoft, buying out the WordPerfect case would be desirable. I don’t expect Microsoft to buy Novell. First off, I don’t think Microsoft can directly use Novell more effectively than it can indirectly use Novell. Microsoft is quite satisfied with Novell’s constant support and assistance in spreading Microsoft technology throughout the Open Source ecosystem. It enhances Microsoft’s message that they are an Open Source-friendly company and it gets their technology into the minds and machines of people who wouldn’t touch a Microsoft product if it was clearly labeled one. Buying Novell can’t do this any *better*, it would just make it more transparent. Consider how many people would be gung-ho about promoting mono/moonlight if it came straight from Microsoft, rather than through Novell. Second, I don’t think Microsoft wants to *own* anything Novell has – or at least not enough to make it worth buying. Microsoft doesn’t care to *buy* competitors to Windows/Office – it wants to *destroy* them. At best, it wants to incorporate any ideas directly into Microsoft products and discard the shell. Novell doesn’t really offer anything Microsoft doesn’t – it just offers *alternatives* to Microsoft’s offerings. And Microsoft isn’t really big on that. And what it does offer may already be under some license or agreement that Microsoft finds disagreeable. It’s not enough for Microsoft to own a technology, they have to also make sure they can wield that ownership against others. So, how would it benefit Microsoft to directly own Novell? Novell is already doing just about everything Microsoft could hope for. Novell constantly attacks other Open Source companies, spreads Microsoft technology, and sows division and discontent in the community. Microsoft couldn’t get away with that behavior, but Novell can. Novell can hang around for quite some time and serve Microsoft’s purposes – Microsoft can always purchase a new round of vouchers if cash gets too low. Funding Novell is basically an advertising budget line item to Microsoft. >> Novell doesn’t really offer anything Microsoft doesn’t – it just offers *alternatives* to Microsoft’s offerings. Microsoft wants Novell’s business customers, but they can get it cheaper than through buying Novell. Think of pirates. Why buy that ship on the high seas (if you aren’t interested in more ships) when you can assail it, mount it, and rob it of all its really important valuables? Channel partners will be pulled towards Pirate Microsoft, and Pirate Microsoft sympathizers aboard Novell (including those who mounted the ship) will help out. Later, Pirate Microsoft just leaves the leftover carcass hull while it further takes numerous key employees on board the Pirate Microsoft ship. Well, Novell ‘owns unix’ don’t they? They think they do anyway. They have a decent patent portfolio – that is afterall why MS are paying them, I guess. Probably still be here all of 2009 – unless they get some rogues running the ship who just want to strip it’s assets for cash. I agree that Novell is more useful to Microsoft as an isolated company — for now. Shane, be careful installing new plugins. It was flaky the last time I tried. Compatibility is an issue too because we’re on LTS (up to date). First off, I don’t think Microsoft can directly use Novell more effectively than it can indirectly use Novell. I think you meant viceversa, right? With the mythical stolen code in Linux. No, I mean that Novell is more useful right now to Microsoft in its current role as cat’s-paw. SJVN said the same thing a few weeks ago. This may change some time down the line.